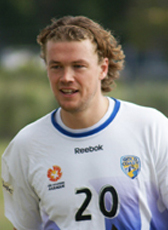 Paul Beekmans joined Australian outfit Gold Coast United in June 2011. The midfielder was out of contract after a three year spell at SC Cambuur. In January 2012 he decided to return home due to personal problems. In May 2012 he confirmed a 2-year contract at Almere City until June 2014. In summer 2013 Beekmans moved to FC Eindhoven for the 2013-14 season. He also extended his contract with another year until June 2015. At the end of this season Beekmans left FC Eindhoven and went to his former club FC Den Bosch where he is going to play on amateur base. At the same time he signed a three-year contract as an accountmanager at one of the sponsors of FC Den Bosch. In January 2016 Beekmans retired as a footballer, but started as an assistant trainer at FC Den Bosch.